2018 Model Princess 43 fitted with the larger Cummins QSB 6.7-550 (2 x 550hp) engine option with just 80hrs. One owner boat supplied by ourselves. Boat can be purchased ex VAT for export subject to conditions. 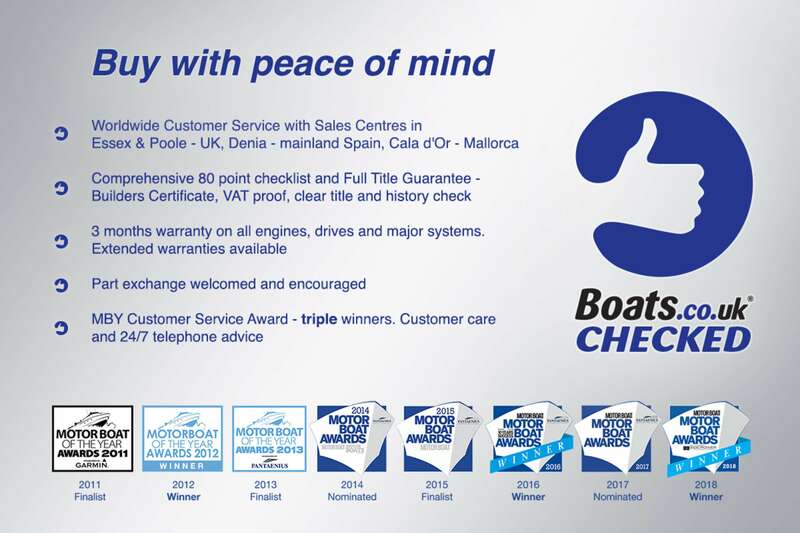 ** NOTE - THIS IS NOT A BROKERAGE BOAT - This STOCK boat comes with a full warranty, Clear and full title and VAT papers. Part exchange welcome and encouraged. Finance plans too & all supported by our 24/7 triple-award winning customer support team. Please take this into account when comparing against other boats! ** White hull with high gloss walnut interior. Full specification including hi-lo bathing platform, upgraded 9.5Kw generator, bow and stern thrusters, AV upgrades, Raymarine navigation package and Eberspacher diesel heating. To arrange viewing, please call James at Princess Poole at Salterns Marina on +44 (0)1202 797777. Viewing by prior appointment please. Generator - 9.Kw Generator with Hydrohush Exhaust System. Covers - Grey Sunbrella Cockpit Covers Flybridge Tonneau Cover in Grey Sunbrella Mosquito Screens fitted to Port Lights 6 Fender Socks. Buy this boat for as little as £7,402.41 per month. Insure this boat for as little as £4,829.66 per year.